A New Delhi-based employment solutions company, conducted an employability-focused study based on 150,000 engineering students and found barely 7 per cent suitable for core engineering jobs (as featured in India Today). In addition, we see lots of reports/ news articles about unemployment in India, IT industries reducing intake etc. While it is evident that a large number of students join engineering courses, the big question is If they are developing the skills needed to meet industrial standards. While analysing the root cause for this, we find varied reasons why engineering students are disappointed/ unemployed. But the most important reason behind all this is their “Fundamental approach to Engineering” or “the way they learn engineering”. Do you really find a change in the way we learn from K.G to High school? From high school to Engineering? The objectives of each of these stages is different and so they way of learning should also be different. While in school, the objective is to understand concepts of science and while pursuing engineering, the objective is to develop skills using which one can implement the science concepts and solve real life problems. Engineer is the one who can identify and solve problems using technology. Learning through text-books and producing that in exams to score marks is good enough to prove that you understood the concepts. But it doesn’t show that you have the ability to apply that concept and solve a problem. This is the biggest reason for low employability because engineers graduating by reading textbooks don’t really possess any ‘engineering skills’. So if you want to know what it takes to become a real engineer, here are the most obvious things that you should do during your engineering curriculum. Engineering Projects are considered as burden and least cared by most students. 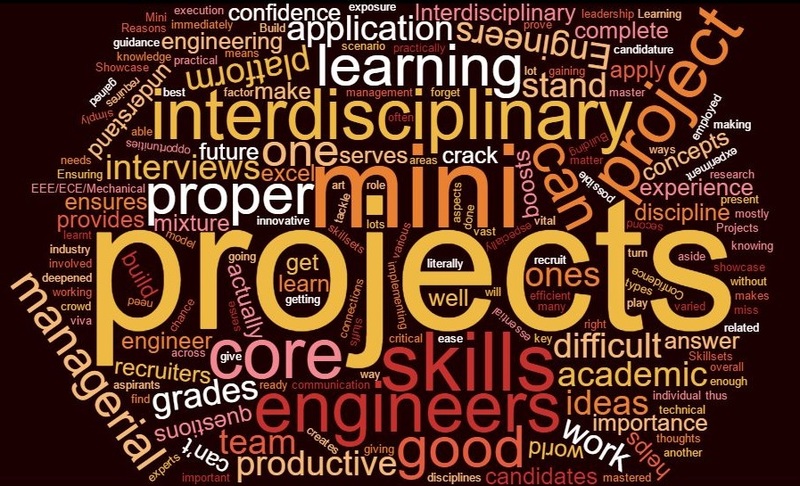 Majority of the engineering students just consider engineering projects to be just another subject and develop bad projects that lacks innovation or buy projects from grey market. But it is the most important subject in the entire engineering curriculum that helps them develop engineering skills. Obviously, there should be some strong reason why intellectuals kept it at the very end of engineering curriculum while framing the syllabus. The true intention of your final year engineering project is to help you apply your learning that you got right from the first semester in a practical manner. In today’s competitive world, you need to start developing projects practically right from the first year to acquire hands-on skills. You will truly understand the impact of engineering and become a better engineer by building a lot of projects. Building projects is a great way to learn engineering concepts and this knowledge will help you to build great things when you advance in your career. This is one of the important skills that core companies look for during recruitment, because they need engineers who can solve industrial problems not just a text-book genius. Building projects hands-on not only develops your technical skills but also helps you to acquire other skills like collaborating with team members, problem solving ability, critical thinking, designing solutions, leadership skills, presentation skills etc. Simply put, can you use technical language to convey your ideas to other engineers? Can you draw scientific diagrams to communicate with other engineers and understand their work? All these skills can only be acquired through hands-on experience; there is no book or journal to help you develop these skills. And these skills are much needed to work in an industry and you are not eligible to work unless you possess these skills. These practical skills helps to meet the industrial standards and greatly assist you in getting core jobs. Building projects practically is a great way to acquire these skills. You need to start developing these skills as early as possible to master them. You can use your lab facilities effectively to develop a better understanding on the engineering concepts that you are learning and in the same time you can develop hands-on experience on them. Developing such hands-on experience will surely help you to land in your dream core job. So don’t waste your time. Start building projects and enjoy engineering! How Skyfi Labs Courses helps an engineer to develop projects and get hands-on experience? Keeping this in mind Skyfi Labs has developed Online Project Based Courses by which you can learn and build innovative projects at your own pace and time. These courses are equiped with Learn-Do-Review methodology that ensures proper learning and application knowledge. It also gives you an unique opportunity where you not only build cool projects but will also learn and showcase your skills to the world by uploading working project videos on internet. With the hardware kits(dispatched within 24 Hrs) and excellent video tutorials, completion of mini project on time can never be a problem. These Online Project Based Courses lets you to work as a team and improve your managerial skills as well. You can also innovate and redefine the projects under the expert's guidance from Skyfi Labs. Certificate with unique codes will be provided for all enrolled after successful completion of the project which helps in ensuring it a certified project course. Build Innovative Projects using Skyfi Labs Online Project Based Courses. Click here for more details.